I go over some of the common fallacies committed by so called 9/11 truth debunkers when debating 9/11 skeptics. In a nutshell, they ignore the content of truthers arguments or create misrepresentations of the claims which call the official story a lie. Just before the weekend, thanks to your continued pressure, the Senate rejected an extension of the deceptively named and much abused Patriot Act. Please continue speaking out because they are going to try against to push this outrage through again on May 31st. Sign your "I Object!" Citizen’s Objection to Majority Leader Mitch McConnell and your U.S. Senators letting them know you object to ANY extension of the NSA's massive illegal surveillance state - including the phony "reforms" in the House-passed USA FREEDOM Act. 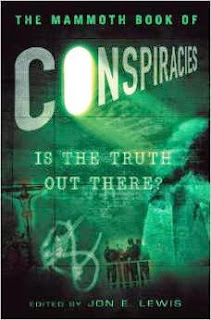 In The Mammoth Book of Conspiracies author Jon E. Lewis does what most books of this sort try to do, which is present a point-counter-point overview of conspiracy topics. Lewis does present some goods points and sources regarding 9/11 truth material, but favors the non-conspiracy view based on incorrect information so I thought I'd respond to a few things. 1. "NIST's findings are supported by a whole range of independent researchers." Even if the flawed argument of ‘strength in numbers’ is to be seriously considered, the comparison should actually be between the AE911Truth petition signers and those who have publicly supported the official story - after studying the evidence for controlled demolition. The latter group only consists of the several dozen engineers that created the NIST WTC reports, along with a handful of various professionals who have openly advocated NIST’s claims and dismissed those of AE911Truth. This total pales in comparison to the 2,340 architects and engineers who are currently calling for an independent investigation of the destruction of the Twin Towers and WTC Building 7. 2. "What the controlled-demolition hypothesis fails to take into account is the aviation fuel carried by the planes"
PM [Popular Mechanics] ... quotes WTC assistant structural engineer Leslie Robertson as stating that the Towers were only designed to take the impact of a Boeing 707, but did not take into consideration the fires that would be produced by the jet fuel. After 9/11, Robertson stated, “I don’t know if we considered the fire damage that would cause” (pg. 31). Although PM mentions John Skilling briefly in their book, they make no mention of this statement. Apparently, PM felt no ne ed to quote the lead WTC engineer on his views about the structural stability of the Towers. 911myths .com, Debunking911.com, and RKOwens4 do not even acknowledge Skilling’s existence, much less mention this statement. It’ s important to point out here that the paper Other Collapses in Perspective: An Examination of Other Steel Structures Collapsing due to Fire and their Relation to the WTC, also by Adam T aylor , proves the following conclusion. If you think not, you let us know. When we recognize how much fuel actually remained in the buildings, we can instantly see how ludicrous it is to compare the Towers to these other steel structures [that have collapsed due to fires] . How can it possibly be justifiable to compare the Towers, which each had only about 3000 gallons of jet fuel remain on the fire floors, to structures like the Mumbai High Platform, which likely had over 1,000,000 gallons of oil to fuel the fires, or the Interstate 580, which had 8600 gallons of gasoline fueling the fires below it? Likewise, the heat from these fires has been greatly disputed. As we have already seen, NIST has no evidence of high temperatures in either building. Their estimates of 482 ºF as the highest temperature the steel in the buildings reached is consistent with estimates of the maximum temperatures reached by the jet fuel fires. 3. "Demolition experts have also weighed on on NIST's side." By my count there are eleven people with demolition expertise questioning 9/11 vs two who are speaking out in support of the official 9/11 story. One of the individuals speaking out in support of the official story also happens to be in charge of the demolition company who got the contract to clean up ground zero and one of his former employees is among the demolition experts who supports the 9/11 truth movement. 4. "The weight of evidence is that al-Qaeda, and al-Qaeda alone, xarried out the 9/11 attacks." To the contrary, the NORAD-stand-down, various whistleblowers, and physical evidence centered around the destruction of the 3 World Trade Center Buildings in New York, make a strong case that the attacks involved substantial inside help. Chinese food was devoured . . .
Caffeinated beverages abounded . . . Cell phone chargers were being shared . . .
For 10 1/2 hours, Rand Paul filibustered the so-called "Patriot" Act until just before midnight. C4L staff was in for the long haul too, settled in for the long night working to gin up support nationwide for Senator Paul's continued filibuster on the Senate floor. By morning, I’m sure senators had a pile of faxes from concerned constituents waiting for them. Senator Paul’s actions yesterday delayed any actions on the “Patriot” Act by at a full day. Now it’s up to you and me to create enough pressure to run out the clock on the surveillance state. That's why it's vital you sign your "Stop the Surveillance State" Fax Petition so our staff can deliver it to your U.S. Senators immediately. Tell your senators you’ve had enough of warrantless wiretapping, bulk data collection, and mass surveillance. Let them know you’re not fooled by the so-called “reforms” of the USA FREEDOM Act that will not end bulk data collection, despite claims in the media to the contrary. This fight is not over, and you and I can continue to have a tremendous impact on this debate. So if you've already signed, I hope you'll forward this email to your friends and family, imploring them to stand up for their civil liberties and Stand with Rand against the surveillance state. Thank you for all you do. We've got the statists on the run. Let's keep our foot on the gas! P.S. It's critical we flood the Senate with as many faxes as possible from freedom-loving Americans opposing NSA spying. Senator Paul spoke until his voice was giving out last night, I trust you’ll continue to stand with him on this important issue. That's why I hope you'll please chip in whatever you can afford to help C4L expand our "Stop the Surveillance State Banner Bomb" and work to defeat the so-called "Patriot" Act. Do you want to roll back the loss of civil liberties since 9/11? If so, please take a few seconds to sign this message to your representatives in Congress to say NO to extending Section 215 of the PATRIOT Act. This is the section that gives the authority to collect data from almost all of our phone calls. It is due to expire June 1st. However, without a mass protest, Congress will extend it. If you have a few minutes, also call your representatives. This is 10 times as effective! Thank you for what you do for a better world!